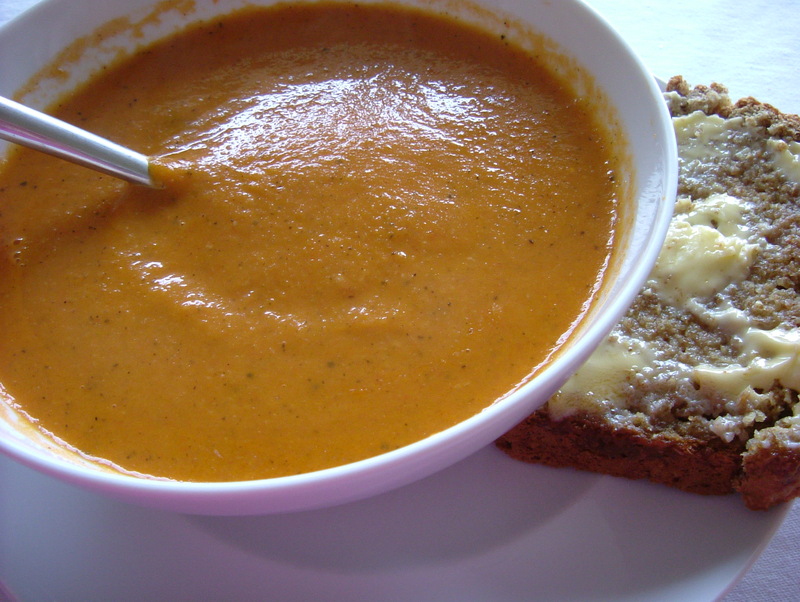 The weather has been rather autumnal lately and when the skies are overcast and grey I always feel like having a tasty bowl of soup for lunch. 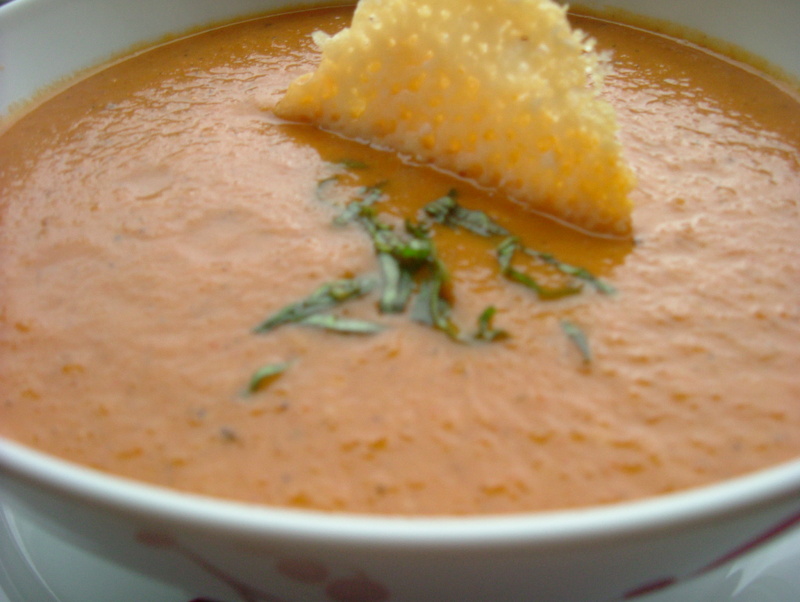 This roasted tomato soup is so easy to make but has a wonderful deep savoury flavour and most inviting warm colour that goes some way to brightening the day. I use dried basil, which gives an almost aniseed flavour, before roasting as fresh basil tends to crisp quite quickly and then I finish off with a sprinkling of finely chopped fresh leaf on the finished soup – which gives a lovely fresh zing to the soup. 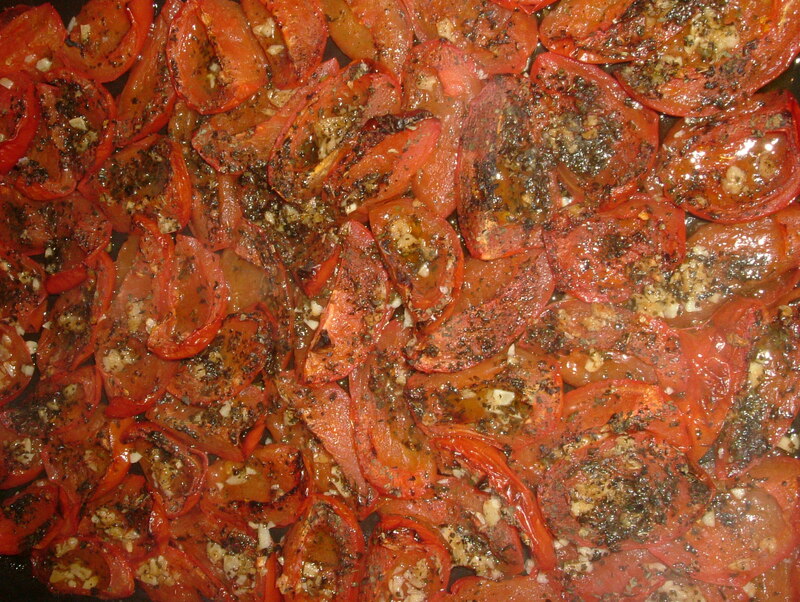 Preheat the oven to 200ºC. Wash and then quater all of the tomatoes, removing the centre stalk and seeds. Place in a roasting tray and sprinkle with the finely chopped garlic, sugar, dried basil and a good pinch of sea salt and black pepper. 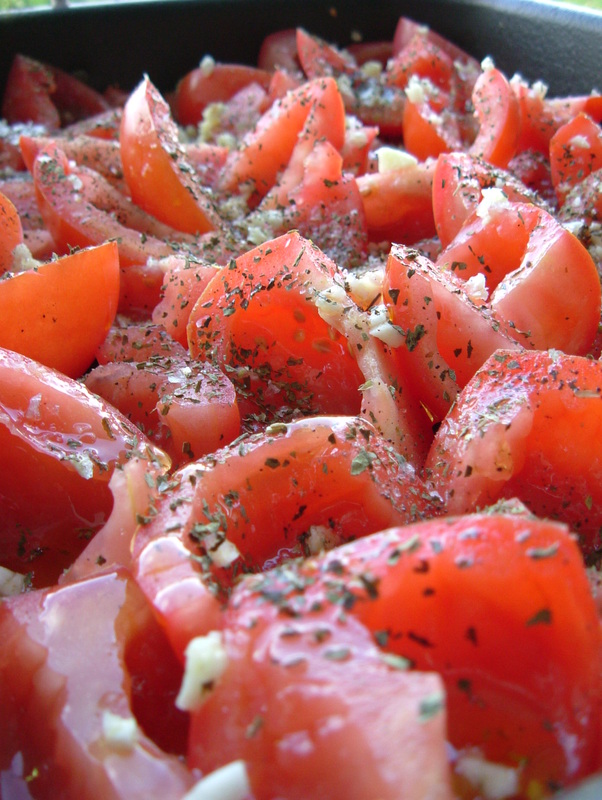 Drizzle with olive oil – enough to coat each tomato roughly and lightly but not too much to soak them. Place the tray in the oven and roast for approx. 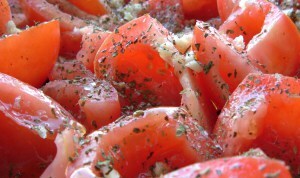 45 minutes until the edges of the tomatoes become slightly charred. 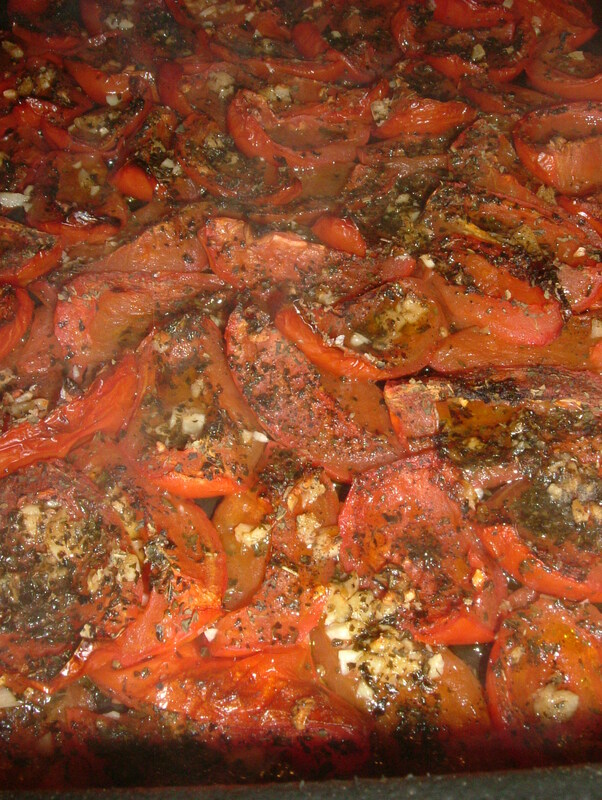 Remove the tomatoes from the oven and leave in the roasting tray to one side. Heat a couple of tablespoons of oil in a heavy pan on medium heat, add the onions and roughly chopped garlic and stir to coat all in the oil. Turn down the heat, put on the lid and allow to sweat for around 8-10 minutes, checking every now and then to stir and make sure they aren’t browning. 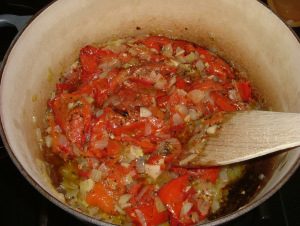 Add in the tomatoes and all of the lovely juice that has collected in the tray into the pot with the onions, stir well. Add in the stock and bring to the boil. Reduce heat and allow to simmer for around 10 minutes. Then use a hand blender to blend the soup to a smooth consistency. Seive the soup to remove any seeds or skin and warm through gently when required. Check seasoning and sprinkle with the fresh chopped basil just before serving. 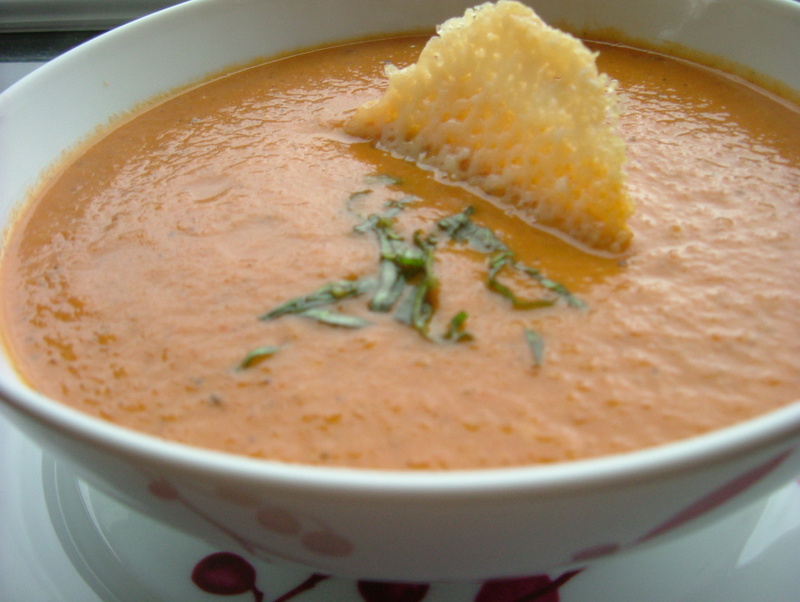 I sometimes add a sprinkling of parmesan to the finished soup or, if like me you keep the rinds of parmesan in the freezer you can add a rind to the soup after it has been seived and whilst it is warming. On this occasion I served with a parmesan crips – a small mound of grated parmesan melted in a non-stick frying pan until lightly golden and then cooled. Serve with some lovely fresh soda bread. Hot Chilli Bean & Feta Soup for a cold day.In "Lunch"
This looks lovely. I need to buy some tomatoes asap! Hello Hollybee :) we had it for lunch yesterday and it was really nice. My son loves his soup and this is a great one for kids especially with parmesan. with a decided chill in the air autumn and soup time is upon us. this one still sounds promisingly summery though. Hi there! Yes you can certainly feel autumn drawing closer can’t you? Summer is an ideal time to make this when tomatoes are lovely and ripe. Looks good – may have to try it tomorrow! 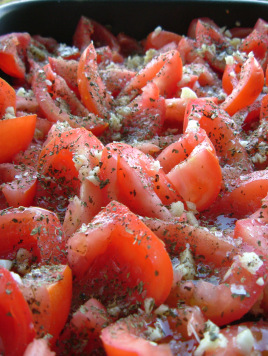 Hi Yvonne :) it is a lovely way to make tomato soup especially during times when sweet flavoursome tomatoes are hard come by.